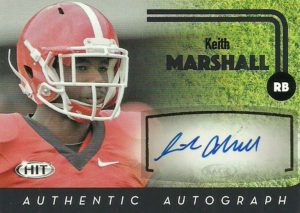 Keith Marshall played for the Georgia Bulldogs, where he and his buddy Todd Gurley formed a one-two punch at runningback. An impressive track man with the speed to boot, Keith ran a 4.31 40 at the combine, leading all prospects. He’d finish his 4 year stint at Georgia with 1379 yards on 253 carries and 12 TDs. His numbers would certainly have looked better if not for an ACL tear he suffered in 2013. The Redskins selected Keith in the 7th round of the draft, intrigued by his boom/ bust potential. A nagging elbow injury ended his 2016, and then in 2017 Keith tore his patellar tendon, bringing his season to a close before it had even begun. Still recovering from the injury the Redskins waived him with an injury settlement during the Summer of 2018.